Learn the Subtalar fusion and Talonavicular arthrodesis (open technique) using Stryker anchorage 2 plating system surgical technique with step by step instructions on OrthOracle. Our e-learning platform contains high resolution images and a certified CME of the Subtalar fusion and Talonavicular arthrodesis (open technique) using Stryker anchorage 2 plating system surgical procedure. 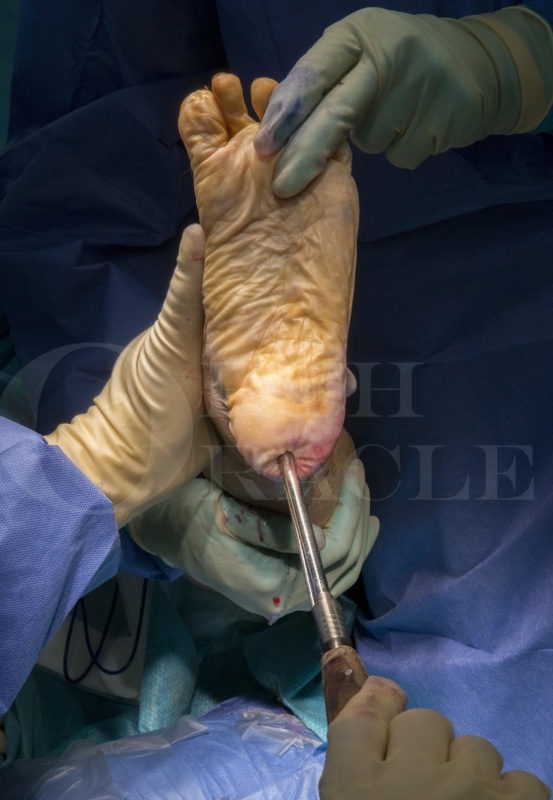 Double arthrodesis of the subtalar joint(STJ) and talonavicular joint(TNJ) is a highly effective method of correcting deformity in the adult flat foot with or without arthritis. It is most commonly, though not exclusively, used for this indication. A double fusion will not only correct deformity but will also fuse the arthritic joints so achieving a dual objective of pain relief as well as deformity correction. The traditional approach to these situations would have been a triple fusion with the aim of abolishing movement in all three joints of the hind foot (Choparts joint). It is now recognised however that the calcaneocuboid (CCJ) joint is largely inactive with very little movement in these situations and that its inclusion into the fusion offers very little additional in terms of abolishing movement or pain as it is usually not primarily responsible for painful symptoms. Rather than arthritis of the CCJ, it is often sub-fibular impingement that causes the lateral pain in the approximate location of the joint, along with inflammatory changes in the sinus tarsi. It is also the case that the CCJ does not suffer OA changes after the double fusion and therefore the risk of recurrent symptoms is low. It is therefore now increasingly common to use a fusion of the STJ and TNJ joints and ignore the CCJ to achieve the same or similar results as a conventional triple fusion offers. The ability to correct deformity by the use of a double fusion can be augmented by performing adjuvant procedures such as the Evans calcaneal osteotomy (to lengthen the lateral column), calcaneal body osteotomy (medialising or lateralising) or a plantar flexion shortening osteotomy of the medial cuneiform(Cotton osteotomy). These are reserved for severe deformity where correction cannot be achieved by subtalar and corrective talonavicular fusion. The Stryker Anchorage 2 CP midfoot fusion plating system has many unique features. It is made of anodised titanium and is a low profile compression plate with 2 proximal locking, two distal locking and one compression screw from distal navicular to proximal talus. It uses a template to position the plate with a laser mark on the template that allows one to position the plate accurately. The laser line can be positioned over the joint line which will automatically position the screws holes over the talus and navicular in an optimal fashion. It has a compression hole which sits in a concavity on the plate with a corresponding convexity on its under surface. This requires the bone to be reamed so that this convex prominence sits into the bone to make the plate flush with the underlying bone throughout its length. It is normally used medially but can be used dorsally particularly if there is a dorsiflexion deformity of the first ray that requires to be corrected at the talonavicular level. The compression screw uses the principle of dynamic compression plating to effect a strong compression of the fusion site. Institution: Aneuran Bevan University Health Board, Wales .